Applied the top coat over the straw insulation today. Used a full bag of clay, a quarter package of iron oxide colouring, and a couple heaping spadefuls of sand to start – mixing that all with enough water to get the consistency of thick peanut butter. I then mixed in about 1/5 of a bale of straw, all cut up pretty fine. Talk about a workout! I’m still working on a design for a steel roof structure to build over the oven – and protect all this hard work from rain and snow! 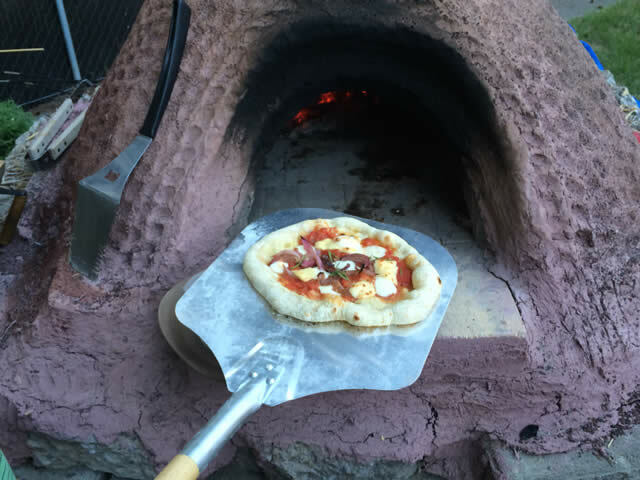 Well, after getting the main dome of the oven completed a few days ago, I let the oven sit for a couple days, then carved out the door, and pulled out the sand – and it didn’t collapse! I let the oven sit for another day, and then couldn’t resist building a small fire, to move the process of drying out along. Today I started applying the insulation layer – a fairly wet mixture of clay, sand, and straw. I used fairly equal ratios of sand and clay, mixed with water until I got a consistency that was similar to a medium thick milkshake. Then I kneaded in handfuls of straw. Once the straw was completely coated in the clay/sand mixture, I added more straw, and repeated. I wanted the straw clumps to hold together – so once I thought the clumps were just about not staying together, I quit adding straw, and kneaded a splash more water into the mix. I then threw big clumps of the mixture around the base of the oven. I want to try and build up a 4 – 6″ layer of insulation. Unfortunately, I didn’t have enough clay to make the insulation mixture cover the entire oven. So I’ll be off to Plainsman Pottery this week to get a couple more bags! I’ll buy extra so that I can put a final finishing layer over the insulation. Well, this weekend was a bit of work! Saturday I formed the sand dome, which acts as a form for the actual oven. Used about 500 lbs. of sand! The floor of the oven is an elliptical shape – 32″ wide x 36″ deep. The height is 17″. After shaping the dome, I covered it up with junk mail flyers – soaked in water. The following day, I built up the oven itself, making a lot of baseball sized balls of sand, clay and water. The mixture wasn’t too wet – just enough to keep the sand and clay together. I did manage to get the form covered over completely – with a brief interruption by mother nature and some much needed rainfall. In a couple days, I’ll lay out the oven door, and cut it out. Then the moment of truth when I get to remove the sand form! I’m planning on making the opening around 11 1/2″ tall, and 16 – 18″ wide. Once the opening is made, I’ll build a door, and then add 3-4″ of straw and clay insulation to the exterior of the oven.